Would you know what to do if you were stranded in the wilderness? No one knows more about survival than the U.S. Army. But you don't have to be a soldier to benefit from all the vital information its field guide has to offer. A survival guide for any situation. A wealth of life-saving information includes proven tactics for finding potable water, getting food from plants and wildlife, creating shelter, building a fire, using the sun and stars to establish directions, identifying poisonous snakes and insects, handling medical emergencies, and much more. Campers, hikers and anyone who loves the great outdoors will want to keep this civilian's version of the manual packed with their gear. Filled with clear illustrations and diagrams, it's the most authoritative guide to toughing it out on unfamiliar turf -- whether you're lost in the desert, the tropics, the arctic or at sea. 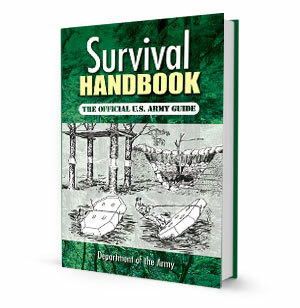 An important addition to every home library, the Survival Handbook is a practical resource for protecting yourself and your family. A 288-page survival guide for any situation. Great for campers, hikers, and anyone who loves the great outdoors. Includes an appendix with excellent color photos. A practical resource for protecting yourself and your family.